Novelist Gabriel García Márquez died on April 17, 2014 in Mexico City. His 1967 novel "One Hundred Years of Solitude" gained him the Nobel Prize in literature in 1982. He authored novels, short stories, and books and articles reporting on Latin American realities. According to an admirer, he "was often compared to Hispanic literature's other titan, "Don Quixote" author Miguel de Cervantes. From 1955 on, García Márquez, widely known as "Gabo," lived in exile from his native Colombia. El Espectador newspaper that year, having learned that dictator Rojas Pinilla's government objected to his reporting, assigned him to a story in Switzerland for safety reasons. Subsequently García Márquez lived and worked in Europe, Venezuela, and Mexico. Leery of imprisonment under Colombian President Julio Cesar Turbay's Security Statute, García Márquez in 1981 settled permanently in Mexico City with his family. In addition to being a novelist, García Márquez was a journalist. In particular, he founded, wrote for, and helped fund the Colombian Magazine "Alternativa," published in Bogota from 1974 through 1980. A recent commentator regards it as "one of the most innovative, modern, and revolutionary publications of the left in Colombian history ... Gabo contributed not only his credibility as a writer, but also his work as reporter, the beautiful craft he never wanted to give up, and as permanent advisor to the editorial team. He did stories and interviews on "Chile under fascism, socialist Cuba, Vietnam triumphant over U.S. imperialism, de-colonizing Africa, and Portugal boiling over." Indeed, Gabriel García Márquez was a hero for the worldwide left. In 1957, in Venezuela, he reported on dictator Marcos Pérez Jiménez' expulsion. He went to Havana shortly after January 1, 1959 to report on the victory of the Cuban revolution. He stayed for two years helping to establish the Prensa Latina news service. Later he served the Russell Tribunals' investigations of human rights abuses. He promoted negotiations between the Colombian government and insurgents groups. For three decades García Márquez was barred from entering the United States. García Márquez and former Cuban President Fidel Castro were friends for half a century. Castro often reviewed the author's novels prior to publication. In 1998 he chose García Márquez to carry a message informing U.S. President William Clinton that Cuba would share intelligence about U.S.-based terror attacks against Cuba and the United States. An FBI delegation visited Havana to collect the material. Afterwards, however, the FBI went on to arrest Cuban agents providing the intelligence. They became the Cuban Five political prisoners. 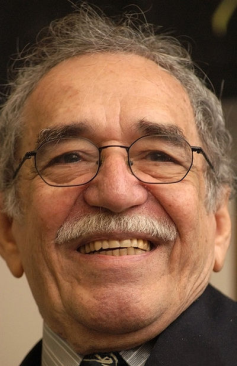 Writing in Revista Cambio in 2002, García Márquez extolled his recently deceased friend Gilberto Vieira, longtime secretary general of the Communist Party. He "never abandoned his convictions" and "will remain in the memory of the country as a thinker and an intellectual." He has Vieira's daughter Constanza testifying to her father's "respect for the ideas of others." Years earlier, the author visited Vieira living in concealment, his party having been declared illegal. Their conversation proceeded only with Vieira rocking the cradle of baby Constanza, crying then but later a distinguished journalist. The novel "One Hundred Years of Solitude" tells of generations of the Buendía family and of obsessions, myths, and ghosts. There is history too, especially that of the United Fruit Company banana workers on strike in 1928 near Santa Marta, close by, as it happens, to the author's fictional Macondo. One family member was "the colorless José Arcadio Segundo," who "gave up his position as foreman in the banana company and took the side of the workers. ...The great strike broke out...José Arcadio Segundo was in the crowd that had gathered at the station ... [T]he army had set up machine-gun emplacements around the small square... The captain gave the order to fire and 14 machine guns answered at once. Several voices shouted at the same time: "Get down! Get down!" The people in front had already done so, swept down by the wave of bullets. The survivors, instead of getting down, tried to go back to the small square, and the panic became a dragon's tail as one compact wave ran against another ... When José Arcadio Segundo came to he was lying face up in the darkness. He realized that he was riding on an endless and silent train and that his head was caked with dry blood... he made himself comfortable on the side that pained him less, and only then did he discover that he was lying against dead people." W.T. Whitney Jr. grew up on a dairy farm in Vermont and now lives in rural Maine. He practiced and taught pediatrics for 35 years and long ago joined the Cuba solidarity movement, working with Let Cuba Live of Maine, Pastors for Peace, and the Venceremos Brigade. He writes on Latin America and health issues for the People's World.